VLOOKUP function is one of the most popular and widely used functions in Microsoft Excel. 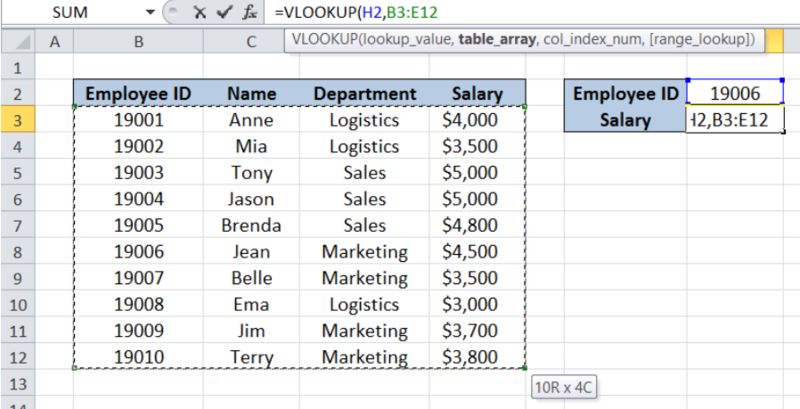 Learning a few tips would go a long way for us to be able to master the VLOOKUP function. 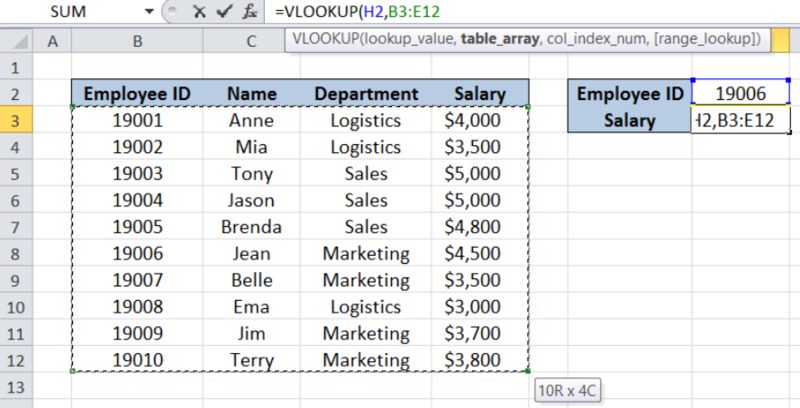 This step by step tutorial will assist all levels of Excel users in learning the best practices for VLOOKUP with table array. The column index number can be hard to determine especially when we are dealing with a large data set. Column index number is determined by counting columns to the right of the lookup value. TIP: When we highlight our table array, Excel displays the row and column numbers of the cell we have selected, relative to the first cell. As shown in the table below, we are about to enter the table array B3:E12. Notice the value at the lower right corner of the array “10R x 4C”. This means that our cursor is in the 10th row and 4th column from the reference cell B3. This way, we can easily enter the column number that we want to display, which in this case is 4, representing the 4th column containing “Salary”. 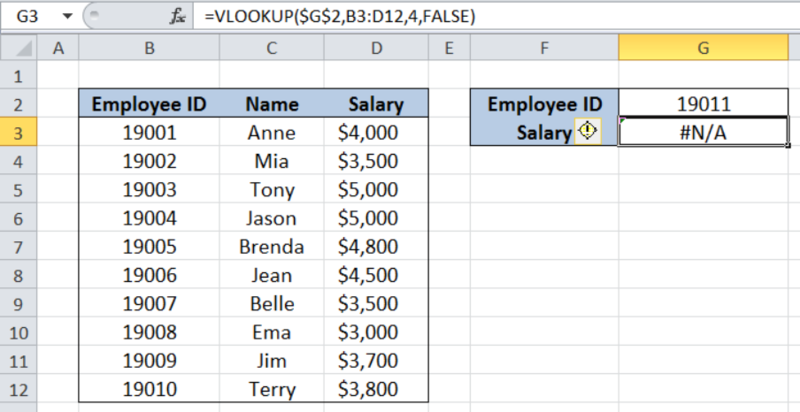 Oftentimes when using VLOOKUP function, we have to copy and drag our formula to other cells along a row or column. Dragging the formula to other cells may cause formula error, because any movement we make while dragging will also be reflected in the formula. Dragging to the right will shift all cells in our formula to the right. Dragging our formula down will also shift all cell references down. We can lock certain cells in place in order to create absolute references by adding the dollar symbol “$”. We can input the dollar sign manually into the formula, or use the shortcut key in Excel that will make our lives easier: the F4 key. Below table shows the different dollar sign combinations. When we tap F4 once, we lock the cell in all directions, and dollar signs appear before the column and row digits. For example, when we place the cursor on H2 in the formula below and press F4 once, H2 is locked and it will not be changed regardless of where we drag our formula. Tapping F4 twice will lock the cell up and down, and a dollar sign will appear before the row digit. However, dragging the formula left or right will still change the column number. Tapping F4 three times will lock the cell left and right, and a dollar sign will appear before the column digit. However, dragging the formula up or down will still change the row number. The errors that can be returned by VLOOKUP include #N/A, #REF! or #VALUE!. We can customize the result and prevent the display of the error values by using the IFERROR function in combination with VLOOKUP. With our IFERROR and VLOOKUP formula, we have replaced the error value #N/A with the text string “Missing Data”. This formula can be easily understood where ID and Data are named ranges. ID refers to cell H2 while Data refers to the range B3:E12. 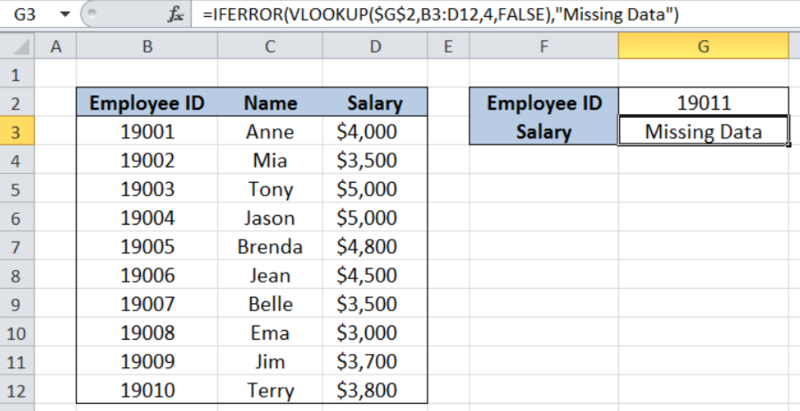 The function is looking for the exact match of the given ID in the table Data and return the corresponding value in the fourth column of Data. The function with named ranges is definitely easier to read. This tip is especially useful because named ranges are normally created as absolute references, which makes dragging the formula in any direction less prone to error and easy to maintain. With VLOOKUP, we can quickly categorize our data in just a few clicks. 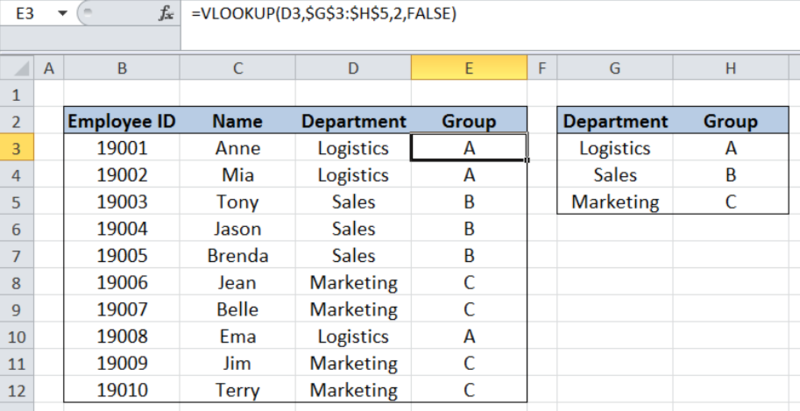 Suppose we have the table above consisting of four columns: Employee ID (column B), Name (column C), Department (column D) and Group (column E). In cells G3:H5, we have the data to categorize departments by group. We want to add the group category into our source table by looking up the department and finding the corresponding group. With VLOOKUP, we have easily categorized the department by group for each employee in the list.